“Intern, who?” This is the answer, or a question, from SocialCops interns if anybody refers to them as “interns”. And, why not? None of our interns work as “interns” at SocialCops, so why should they get addressed as one? Too often, companies give interns the work that full-time employees refuse to do, or need some form of assistance with. Interns are given responsibilities with insignificant, little or no contribution to the company’s actual work. But every decision at SocialCops is made by 20 and 30-somethings who are looking to make a difference with their work. If somebody walks into our office today and try to spot the interns, it is highly likely that they won’t be able to do so. Our interns work alongside the team on independent projects, take ownership of their work, make decisions and drive projects just like any regular employee at SocialCops. How often do we find interns interning with the same organization more than once? Almost never, right? Because students like to maximize their learning by gaining new experiences and doing different internships. But at SocialCops, we make sure that we provide ample opportunities to help our interns grow and learn new things. This is the reason that most of our interns end up extending their internships, do consecutive internships with us, work part-time, and then join in full-time roles after their graduation. Why do we care about building this kind of internship experience? One of our core values at SocialCops is “One Team”. This means that each of our team members — irrespective of their background, experience, gender, age or race — is treated with equal respect. We have always believed in building a meritocracy and have seen that people create incredible growth paths just by taking up new responsibilities. We’re now looking for our next batch of amazing interns. We are currently offering year-round internship programs for 2-6 months, as well as a 2019 summer internship program. If you are looking for your next challenge and are interested in working with us, keep reading for more information. What it’s like to intern at SocialCops? We have always believed that 19-year-olds and 20-somethings can change the world, so we give our interns lots of responsibility. They are expected to solve problems that we have never solved before, and they get evaluated on the same metrics as anybody in a full-time role. Krishna was an intern in our first summer internship batch in 2014. He picked up data visualization as his area of expertise and worked with us in an almost full-time capacity through his final year of university — building and launching his first product (a DIY tool for maps, Viz) while still in college. He joined SocialCops full-time in 2015 and started working on building our data visualization product Visualize, which now is being used by hundreds of leaders including Prime Minister Modi. Ankita joined us in early 2016 as a Research Intern. Today, as a Senior Research Associate, she leads data analysis for some of our biggest government deployments and sets internal standards for our data cleaning and quality processes. These examples aren’t anomalies. One out of every four interns has joined SocialCops full or part-time after their graduation, and one-third of our current employees are ex-interns. Some of our earliest interns have even taken up key leadership roles and evolved to become the pillars of the company. As a startup, our team gets exposed to lots of opportunities and problems. We might not always know the answer, but it’s important that we keep growing and experimenting. We expect the same thing from our interns! We look out for people who are passionate about learning, doing new things and have a steep learning curve. We have always hired exceptional interns who we know can do some great work — and to help them do that, we make sure we provide them with the right mentorship, guidance, resources, and support. A lot of our interns have surprised us by delivering more than what we expected from them and demonstrating our values like “Giving 120%” and “Never Be Satisfied”. They took responsibilities beyond their role, picked up problems that they wanted to solve and figured out ways to contribute through their work in the best possible way. For example, Rohan joined us as a Front-End Intern and soon realized that one of our internal products wasn’t updating its users regularly. He decided to take up the self-appointed product evangelist role and started writing release notes himself — which soon went on to become team-wide practice. We also do regular hackathons and sprints to ensure that our interns get a chance to work on things beyond their regular work at SocialCops. We pick up complex projects, and what follows is hacking, learning and solving problems in the most fun way possible. For example, during one hackathon, some of our engineers created a pricing module for our services team and non-engineers built a technical workflow to automate day-to-day work. Now, how cool is that? Can you intern at SocialCops? Have you picked up the basic skills you’re going to need? If you are a data science enthusiast, learn R or Python for data science, work on Kaggle projects, or create your own models/analytical reports using open data. There is a sea of it! Do you have 2-6 months? Joining for less than 2 months won’t help you learn as much as possible. Carve out at least 2-6 months for an internship so you can make the most of this experience — figure out our systems, learn from the people around you, and leave your mark! If you can’t join for three months (sorry, Delhi University folks! ), reach out and we will try to see if we can figure out something for you. Are you up for the challenges that are going to be thrown your way? To make the most out of interning at SocialCops, you have to join us with a mindset to take on new challenges. When you walk in on day one, your hack week will be designed to push you out of your comfort zone. While you will be thrown with daily challenges from your team members, sometimes it might be that random cafeteria conversation with someone from another team followed by a side hack project that might end up being what you learn most from. Before you hit the submit button on that application — make sure you’re ready to give your 120% to your internship! By now, you must have gotten a glimpse of what it is like to intern here. Now let’s talk about the things that you will be working on if you join us as an intern now — the tech stack, the projects, the campaigns and all the things that will make this an internship to remember. We are at a very interesting phase at SocialCops. On the one hand, some of our products have scaled tremendously and we’re charting out our plans to bring to every organization worldwide. On the other hand, some of our newer products are finding product-market fit — the exhilarating phase of finding the “Aha” moment for our users. Our learnings from scaling our first product and our teams have made our team members great mentors. In a nutshell, an internship at SocialCops today will be the best of all worlds — big problems to solve, big opportunities for go-getters with little past experience to prove their mettle, and some wise mentorship rooted in experience. Engineering Intern: Help us build frontends, backends and the infrastructure of our current and upcoming products. Our Engineering Team is working to build products that are currently used in over 35 countries. 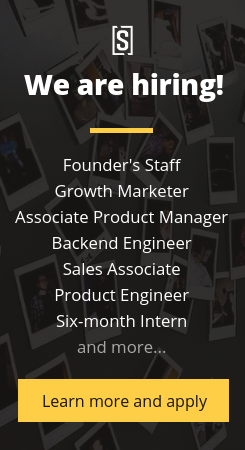 Our interns will work alongside our core team to solve product challenges (e.g. how can we reimagine data exploration for our users?) or core engineering challenges (e.g. how can we scale our architecture, stack and security to cater to our ever increasing customer base?). Data Science Intern: Our data science interns will work alongside our team of data scientists and economists to build algorithms and indices to map the world. Example projects include building a predictive model for malaria and measuring affluence at a 1 km grid by leveraging a variety of data sources — from the Census to satellite and spatial data. Interns are expected to be adept at R or Python. Bonus: Here’s a resource on how to build your portfolio in data science. The blog was updated on 23rd January 2019 based on our current internship roles offered by SocialCops. We’re hiring a limited number of interns whom we can entrust with important business problems. If, at the end of this blog, you are convinced to write your next internship story with SocialCops (of course, you’ll be writing a blog! ), get going and apply soon. We process applications on a rolling basis, and so the earlier you apply, the better the chances you’ll get selected. Check out all our internships and apply here! If you’re not sure about what role to apply to or think that you’d be a fit for multiple roles, go ahead and apply for the roles that you think you’d be a fit for, then mention in your application what you’re really hoping to achieve in the internship. We’ll work with you to figure out the right internship during the application process. Looking for more information? Learn more about our internship application process. I am an economics graduate and learning ML using Python. I want to grab an internship at Social Cops for the Data Science role. Since I am not from Computer Science Background can you let me know what extra care I need to take in order to grab the internship and do you people consider interns outside the CSE domain? Hey I have completed my BTech in 2018 and I’m currently working with TCS. I want to make my career in Data science and Machine Learning for which I’m learning from Andrew Ng, how can I intern with you in 6 months? May I know what’s the last date to fill out the application form for summer internship? I’m a postgraduate student of economics with good knowledge of statistics and econometrics. I can also use STATA and R (self-taught). I’m very enthusiastic about data analysis. Which internship profile would be a good fit for me? Data Analyst? I’m pursuing post-graduation in Economics and I also have good knowledge of statistics and econometrics. I am adept in using STATA and R programming (self-learning) to interpret, analyse and get insights from data. Given my background, I’m confused as to which internship profile will best suit me? I intend to apply for a summer internship at SocialCops. Hi, when will the applications for summer internship go live? Hi Ria! We’ll be opening up summer internships in the next two to three weeks. You can keep an eye on our Careers page (https://socialcops.com/careers) to spot them when they go up, or sign up for our careers newsletter (https://share.hsforms.com/1Ag85PQHyTgCzyx00Col3Sw1d0o3) to get job updates in your inbox. I am a student of Bstat(hons.) at Indian Statistical Institute. I’m willing to do an internship in Data Analysis. Are there any summer internship positions open in Data Analysis? Hi Durga! We’ll be opening up our summer internships in January, so keep an eye on our Careers page for more information. What is the deadline for the application of summer internship position? I have completed my B.Tech in ECE from IIT(ISM),Dhanbad in 2017. Currently, i am learning Machine Learning and Deep Learning. I haven’t solved complex problem, because my system is not so powerful. But, i have implemented some Machine Learning algorithm on some small dataset. I have also worked on CNN and applied it on small dataset. I want to join as an intern for at least 6 months. Please tell me, what should i show in my resume, so that i can fit as an intern ? What project should i choose ? Hi Prem, we are happy to know about your interest in working with us. We are looking for Machine Learning Interns to join our data team. We are looking for someone who has worked on data models, large data sets, and is familiar with ML techniques like SVM, neural networks and deep neural networks such as RNN, CNN etc. Submit your application with details about the projects you have worked on, and if that fits our requirements, we will take it forward! Hi Akshita, we are processing applications on rolling basis, and candidates can join based on the duration of their internship and their availability. Most 6 months interns join in December or January, while summer interns join us in May and June. Having said that, the joining date is flexible and we are happy to work this out with each candidate.